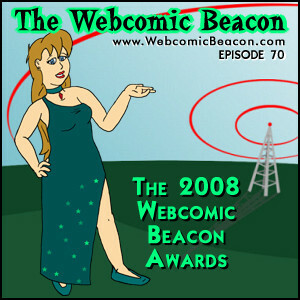 Webcomic Beacon: The 2008 Beaky Webcomic Awards! NO mention of Apple Of Discord? Or Dawn’s Dictionary Drama? And only a brief mention of The Artiste Manquee? Well, did you see the list? It was huge! And there just happened to be many better comics… in fact, there were comics I found later, that qualified, that I totally would have given an award to, but I could not include them because I did not know of them to put them in the list for fairness. Next year will be be more refined… unfortunately the comic list will probably have nearly 5 times as many more comics, if not more. I’ll have to streamline the judging process to not make it daunting. I see that Sandra and Woo is on the short list. It would be really nice to win an award. However, I am missing Gill on your list. It’s not only the best webcomic which started last year, but the best of all which are still updating. Still, those are better than some you DID mention (although I won’t name names), especially AoD and Artiste. But meh, that’s just my opinion. @Novil… you did listen to the entire show, right? whoa! I was not only mentioned on a podcast but put in someones top 10 webcomics of 2008? that’s awesome for such a silly amateur youngster like me 🙂 . nice show guys, looks like I have some more webcomics to check out! InkTank isn’t a new comic. 2008 was its relaunch after a several year hiatus; it has a much older history. I coulda sworn Ink Tank was a relaunch!!!! We could not find the data I think…. Well, like I said, this first year was an experiment. Anyway, Capes n’ Babes was added to the Finalists List, since it was one of Tanya’s Top 10. It was held back on the thought that it might have been older, but I put it back on the list. There were also a couple of REALLY awesome comics that qualified, but were not included because I already had a list, and deemed it unfair. Now, now, no need to fight and fuss. I appreciate the show of support, Jason, but it’s all good… at least I got nominated this time. Frumph’s awards neglected to even *count* me as a new comic from 2008, so this is better… sorta… I guess. I think we both owe Jason something for his enthusiasm! Honestly, knowing I have even one such devoted fan makes me totally not care about any award… At least at this early stage, hehe. And the show was pretty exciting to listen to. Oh, my comic’s one year anniversary also recently passed, back on March 11. Again, just saying. You need to e-mail the beacon about milestones… otherwise I forget. Also, just because we didn’t mention certain comics, doesn’t mean we didn’t like them. I needed everyone to focus on their top picks, and even then we ran over time. Speak No Evil won a Beaky!? I keep worrying how this story is accepted by the webcomic community. I mainly did that comic to get the rust off my drawing hand. Plus I was unemployed back then. Speak No Evil has been cleaning up lately. Its also nominated for an Eisner for Best Digital comics. What about Sailor Ranko? That was hilarious! Just letting you know, webcomics creators are eligible to vote for the Eisners. Go to eisnervote.com, register and check out Speak No Evil.